Hmm... Time to take inventory of the slimes real quick... Lamp Oil Slime, O- Slime, Yellow Paint Slime, Pur-... Red Paint Slime? Blue Paint Slime? You two didn't...! Great... So I need a new RPS and a new BPS. That's going to be annoying to make. Note to self, ask some adventurers to grab me two new slimes from the wild. Let's check the Food Slimes now... Honey Slime? Check. Grape Jelly Slime? Check. Chocolate Slime? Oh, you split and made a second one... Awesome! Hey, little guy, you're about to make me some serious money! Maple Syrup Slime? Check. Butter Slime? Check. Barbecue Slime...? Barbecue Slime...?! Ugh, not another one... Add that to the number of slimes I need to remake... That's really going to hurt the wallet since we're out of brown sugar... Maybe I can get an adventurer to help figure out how I can keep the slimes from mixing and escaping? Well, adventurers? This is a formal Quest being put out to the entirety of the WB.SE Adventurer's Guild. In the past month, I've lost over a dozen slimes. Either they have eaten each other, mixed with each other, or escaped their enclosures/pens altogether and have either run off or been stolen. How can I prevent the loss of any more slimes? I use them for various purposes including selling what they produce, much like a beekeeper. A slime can slip through smaller cracks based on their kind. A paint slime can slip through the crack between a door and door frame, but the lamp oil slime can slide pretty much anywhere water can. Additionally, a sticky material allows slimes some climbing ability, so paint slimes can just crawl up walls if the ceiling is exposed. That said, while some can climb smooth, vertical surfaces, I do not at this time have any that can cling to the underside of smooth, horizontal surfaces. If two slimes meet, either one will eat the other (becoming contaminated and unusable, so imagine if lamp oil got mixed into your milk) or the two slimes will mix (creating abominations like the purple paint slime). Slimes need enough food or liquid to maintain their mass as they do excrete some of it regularly. Slimes do not need air to survive; however, the air available (and lack thereof in some cases) can influence a slime's quality. Some benefit from air. Some benefit from a lack of air. That said, air availability is less of a concern of mine. Slimes do not need more food or liquid than necessary to maintain their size, thus preventing agitation. That said, they do need specific material input based on what kind of slime they are to be. For example, I have to feed a Red Paint Slime appropriate Red Pigment for its paint. If I feed it liquid, I risk diluting it. If I feed it something else, I risk contaminating it. (Like that Purple Paint Slime disappointment is.) A Barbecue Slime is easier to maintain in that I can use a variety of ingredients, thus depleting my food stores for it more slowly, and can cheat on some ingredients temporarily. Skilled mages are limited to the point of being effectively nonexistent. The best I could ask a mage to do is cast an Ice spell constantly to keep the slimes in the enclosure, but the money it would take is impossible to accrue even if I sold the most valuable slimes I have. (Ignoring that one such gold mine ran away today it seems!) Beyond that, even the most talented of mages has enough mana to cast the spells necessary once ever few hours. In the summer, the ice would melt in minutes. Finding enough capable mages would be actually impossible. So, no requiring mages (or magical items), please. Craftsmen likewise aren't generally helpful. Back home, there was concrete I could use, but in this world nobody knows how to make it. It looks like the extent of materials available is wood, glass, stone, rudimentary metals, clay, and so forth. While a craftsman could probably make something, I'm concerned the cracks between pieces will still afford the slimes a chance to ooze out and escape. If your solution requires a craftsman, the fewer pieces and types of materials necessary the better. I feed the slimes myself once a day so they don't get restless nor grow too out-of-hand in size. This means I need some kind of opening or slot that I can put their food into in order to keep them fed. At the same time, this means the slime could potentially escape that way, which I want to avoid. They are semifluid, yes, but I can't just manually separate them by pouring them out. Their membrane will keep them held together. The only reason why I can scoop their internal fluid out is because I can exert more force than their membrane's surface tension does. Anything that isn't inside the vessel I am withdrawing, though, will be retained in the slime which is convenient for preventing resource-loss. Their acidity is about equivalent to Lemon Juice at worst. I make sure to keep them from being too concentrated, but assume a Lemon Juice Slime is just as concentrated as the lemon juice bottles you can buy in a store. (I used to have one before it mixed with a Sugar Water Slime... and now I have a Lemonade Slime... best mistake I ever made.) I try to avoid having anything that's TOO dangerous, so no HCL or HF, but still, I do have Slimes that make food preparation so much easier. Their strength and acidity may not seem that bad on their own, but consider those factors together and the durability of any materials used. The best answer is one that uses the fewest types of materials, the fewest number of fastened-together pieces, holds together well, and gives me the best access to my slimes while they still can't get out. Basically, the best while cheapest pen wins. I'll even pay 10 Silver Coins (100 Reputation) to the winner (once I can place a bounty on this)! Frisky slimes gotta move! If it hits a dead end it will start looking for cracks or go up the wall. But if there is a path of least resistance the slime will take it. It will head off down the pan. Yes, it will circle around, but these are slimes. It will not know it has circled around. It will keep going, moving fast, feeling good, getting that slime energy out in its bundt cake hamster wheel of a pen. This was inspired in part by the phenomenon of the ant mill in which ants will circle around and around until they die of hunger. But you will be throwing slime food over the wall of the pen now and again, so that will not happen to your slimes. Make them big enough to accommodate your slimes; the slime should fill the bottom few inches and most of the jug should be empty space to prevent escapes. A slime that climbs up the wall can't pass the "upside-down" section to get to the entrance. Since it has no bones or structure, it won't be able to hold itself up the wall; so it will just slide (or drip?) down into a puddle on the bottom. Therefore, it doesn't matter if the jugs are corked or un-corked. You can cork or not cork them, as you see fit, or as you need to feed them or combat offensive smells. Lemon juice won't etch glass; a well-made glass has nothing for a slime to get a hold of and won't leak. 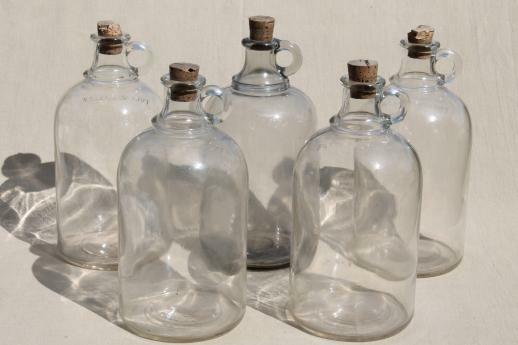 Plus, clear glass jugs make it easy to display slimes for sale. Customers can even safely lean over the top to get a whiff. Do you sniff barbeque slimes for quality? You can use superhydrophobic coating to define, on a suitable surface, a set of cages where the slimes will be bound. Use the coating to coat the zones where you don't want the slimes to go, and let the outer uncovered. Prevent the uncoated zones to form a connected set. Whenever they try to move out, the superhydrophobic surface will make for them impossible to move. If you have no access to high tech, you can patch together lotus leaves. At the end, they gave the inspiration to our scientists to develop such coatings. 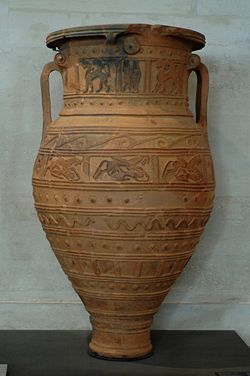 Or use the smaller version, the amphora. What you want is a ceramic pot designed to be watertight/oiltight. Nothing can escape it from the rim down. Use plain clay if you want some oxygen exchange (twice as fast as wood). Or use beewax or a glaze to keep air in/out. While they both have openings that are narrowed, you can choose a design that allows you to let down a bucket, or reach your hand in. Your version does not have to be a traditional pithos or amphora; you can design it to your needs. Multiple versions of these and similar containers existed long before Medieval times, so there should be plenty to choose from. 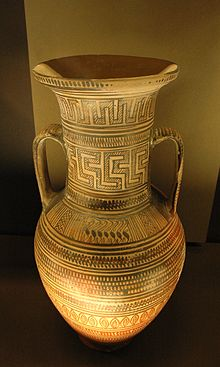 The terms pithos and amphora do refer to very specific shapes and sizes, but don't let yourself be constrained by that. Any shape and size you can imagine probably already has a name. If not, you can have it made for you anyway. To keep them from toppling over (if those slimes get frisky), you can set them partially buried in the ground or use a stand/support. Some have rounded bottoms and some stand on their own. Now, you need a lid. One possibility is a heavy clay disc with a hole in the middle. The hole allows you to pull it on and off without any trouble (use a specialty hook to help you if needed), permits air to circulate, and allows you to dump food inside. Stick a cork in it when you're not using it. A stone lid may be harder to find (as making it fit exactly is a chore) but it may be heavy enough on its own. The clay lids are flat so you can stack other heavy things on top, if you're worried about the slimes pushing them off from the inside. For transport, seal the lid in place with wax. Your jar will be 100% watertight. Soften the wax with heat and scrape it off to remove the lid. When I first read this, I was reminded of a scene out of Fawlty Towers, where Basil and the Major are discussing the presence of a lapdog in the restaurant. Major - Filthy Creatures, I say. Basil - Indeed. It's a shame one can't store them in air-tight containers. Major - Well, he wouldn't be able to breathe then, would he Fawlty? Basil - He could try, Major. He could try. 3) Cleaning, especially with water, can be done at a specific point in time, one at a time, prior to sale. If all this is correct, what you want is a Check Valve. You already ship wine and ale around in your territory via casks I'm assuming, so you have coopers that know how to create watertight (or slimetight) barrels, and given that you undoubtedly have brewing you'll have people around who know how to make a check valve as well. Put simply, a check valve is a special type of valve that lets air and water in, but doesn't let anything out. It's in essence a one-way valve. This means that your slimes can be fed on a liquid diet of some form, and can breathe through the check valve as well, but for all other intents and purposes they are enclosed and can't escape. So; build a really big barn, and store the barrels in them. Run some pipes through for the liquid food, and put a second check valve in there for air. If anyone asks, you're not doing anything really weird in terms of plumbing or 'science' that will get you burned at the stake; you're running a brewing company. Not only will no-one be suspicious, they'll actively protect you. NB; It's probably best at this point to have a few barrels dedicated to actual brewing, so that you actually output a product and make your warehouse look legit. But, I digress. Your slimes will need their barrels cleaned out or changed periodically, but if you have time and manpower, you simply do this one at a time. They can't interact with each other and even though this may seem inefficient, it's got to be less time than you're currently spending trying to keep them apart. So; high quality oak barrels, professionally coopered, 2x check valves per barrel; one for air, one for liquid food, and a regular cleaning / replacement regime for the barrels in which you store the slime. And the bonus; you can sell off this idea to poultry farmers and invent the battery hen model about 500 years ahead of this world's timeline. Slimes can live in a jar for a while but in order to grow and produce they need air for their metabolism. So long term storage in jugs isn't good for business. Assuming the slimes are not fire-proof you can surround them with piles of hot coals or smouldering wood. It's a simple solution that doesn't require any advanced technology. I'm not sure you can get any more medieval than pits of burning coals. I know from experience doing burn piles that a large bed of coals or wood can burn for many days or even weeks without any user intervention. It will also withstand moderate rain without extinguishing. In fact they can be quite hard to put out even by spraying continuously with water. Having said that, if it's really going to start pouring you will need to put your slimes in wine bottles or large jugs and cork them till it's over. Obviously, make the piles wide enough so the slimes can't jump over it. And don't forget to leave them enough room in the center so that they can be reasonably far away from the fire (so they won't overheat). You can harvest them with a long shovel when the time comes. To keep the slimes from mixing you will need to make separate areas for each slime. Trash collection: There is lots of trash from the nearby city, they want it gone and are willing to pay! From time to time plague victims are in high supply and need to be burned anyway. Fertilizer sales: The burnt trash was made entirely of organic material, so its ashes make excellent fertilizer. The local farmers are willing to pay handsomely for your nutrient rich soil additives. It looks like the extent of materials available is wood, glass, stone, rudimentary metals, clay, and so forth. 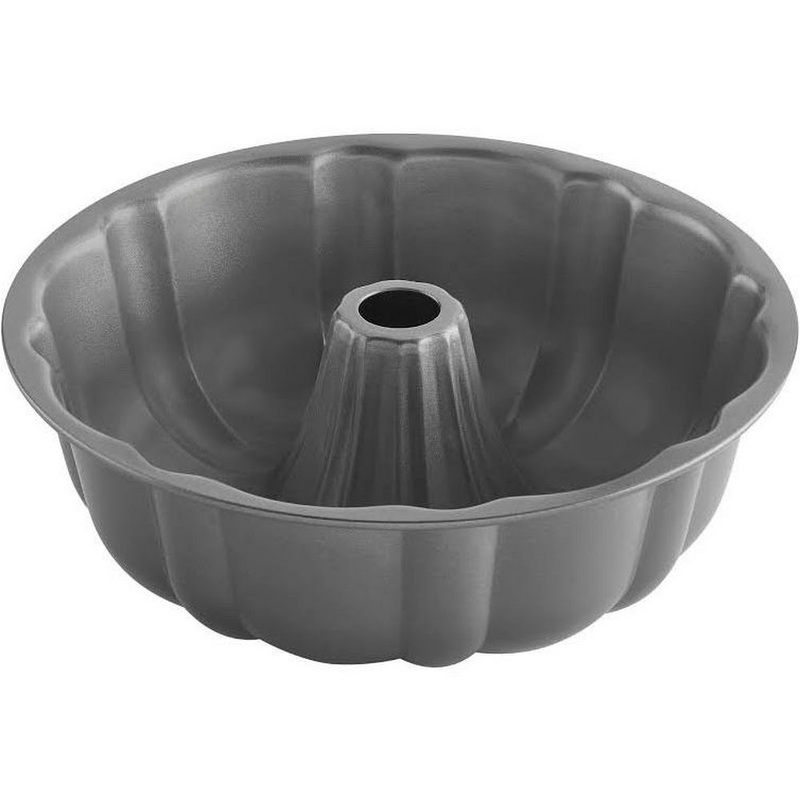 Dig a deep hole, fill the hole with a long clay/glass/whatever jar, have a cloth circle surround the rim at the top, put a flat glass cover over it. Maybe add a few air/feeding holes to it as well; or just air out every now and again. Done. Why dig the hole in the first place? So that the jars can't be knocked over. The cloth is to keep cracks between the jar and lid since they can climb. Cork or rubber might be a better seal for the oil slimes, but it depends on your ability to get it. while some can climb smooth, vertical surfaces, I do not at this time have any that can cling to the underside of smooth, horizontal surfaces. So basically any watertight container with a flat ceiling. The options are many, but for simplicity, go for a barrel with an opening in the center of the top so you can still feed them. This can be covered or corked to regulate air as required. Glass walls are already difficult for most of your slimes to scale. However, using jugs can be impractical, as you may wish to feed some of your slimes larger solids which would be impractical to fit through the narrow neck of such a jug. Wide-mouth glass jars might keep many of your slimes in place, but some of the stickier ones might still be able to scale their walls. Since your slimes are water-based, surface tension undoubtedly plays a role in their adhesion to even the smoothest surfaces; however, this is a solution masquerading as a problem. Certain substances are known to repel water! You may need to conduct some experiments (I'd be happy to help!) but I think a coating of wax, mineral oil, and/or plain old tallow around the rims of such jars may indeed keep the slimes away. Ideally you want something with a heavy viscosity and a high melting point... you don't want it all running off the walls of the container leaving it unprotected... but there are a great number of substances that fit this bill. Beeswax and spermaceti wax are both naturally-derived substances that are at least marginally readily available, and have melting points well above 38°C (100°F) -- beeswax melts at 62°C (144°F) so there's no fear of it melting on a summer day; however, it can be brittle in cold. Spermaceti congeals at 45°C (113°F) with its melting point a few degrees higher, so while it's comparatively less common and more expensive, it may be more suitable for an all-weather repellent. Just keep the containers sheltered from sun and rain (you don't want too much water in your slimes anyways!) and it should do fine unless you're raising your slimes in the desert. Another benefit to this method is that you can instead have glass pans or vats; so long as the walls of the pan are higher than any shape the slime can freely rise to, and the lip is coated with the appropriate wax, they will not be able to escape. These pans can be used to either give your slimes more room to exercise (or breed, in the case of controlled breedings when you want to put two together), or to display to potential customers. The wide, open containers will give the slimes more room to range about while simultaneously providing better viewing, demonstrating to customers how healthy and active your slimes are! For slimes that perform better in an anaerobic environment (lack of air), you can get jars with screw-on lids. If you wish to maintain the display properties, a disc of glass can be used, its rim also coated with wax. A metal ring can then be screwed into place to secure the disc, and the wax will naturally create an airtight barrier while maintaining maximum viewability of your prize slimes! The only downside to this method would be the need to periodically re-coat your containers. Fortunately this should only need to be done once every few months, so you can order a regular scheduled shipment of wax and re-coat the containers in an incremental manner -- for example, if you have 30 slimes, if you get a monthly shipment of wax, you can re-wax 10 containers each month, so it's not such an arduous task. Good luck with your slime-farming endeavors! Are there any (naturally occurring) minerals that slime dislikes? Perhaps, like slugs, they dislike salt? Salt is very easy to acquire, and even shape, in low-tech situations, and salt has a long shelf life. Ants can be contained by lemons. Lemon juice tends to dry out, so needs to be maintained. You need to look after your slime properly - if the things they want are all available to them, they are less likely to attempt to move. This includes intellectual stimulation - puzzles. Some slimes also have their own behaviour patterns - maybe you can use this to your advantage? Territoriality, a social hierarchy. Can you train them, like dogs? Can you herd them like sheep? How fast do they move? Do they have nests? Depending how unethical you are, can you give them some sort of (natural) substance to keep them sedated? As a long term strategy, can you breed them to be more sedate, like cows? Do they sense any sort of pain? You mention glass is available, and broken glass has a lot of sharp edges - make a "fence" of broken glass? My answer is a bit different because it requires you to change your slimes a bit. All slimes have 1 special feature. A core. The core of its slime is its heart or soul. You could even consider it a brain. Now cores have a minimum size. 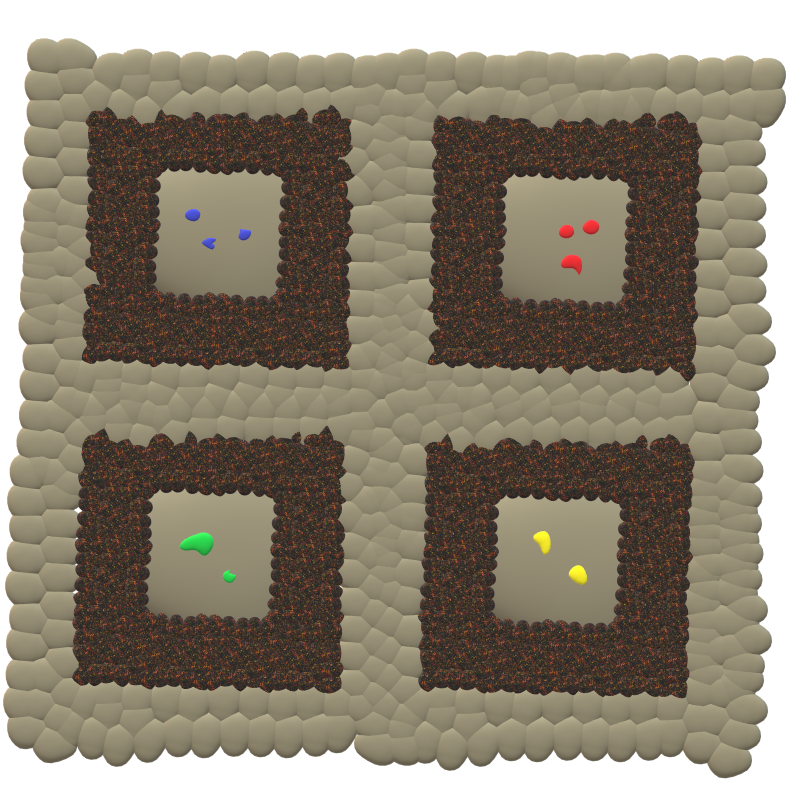 If the core is too large, the slime will split the core into two cores, hence multiplying. If the core is too small, the process is unsustainable and the slime will die. What you want to harvest is all that rich slime the core produces. Now the best way to harvest slimes, is to simply create a cage with a series of holes in it just smaller than a slimes core. That way, even if the slime was to duplicate itself, it can't escape and instead, all that extra slime it produces is pushed out of the hole for you to harvest. You could even set it up so all that extra slime drips into the bottling machine to extract all that slimy goodness without any human effort. If you want to be even more efficient, simply cage up the core and leave a few holes for food to go into and slime to come out of, to increase the production rate of your factories. Slimes aren't fussy. They just eat and make slime all day. Not the answer you're looking for? Browse other questions tagged magic fauna mythical-creatures construction security or ask your own question. What might be dangers of connecting your own soul to a stronger soul? What kind of world would it be when its main species are slimes? What is the ecological role of the common fantasy monster, the slime?